Almost every American school kid is familiar with the story of Custer’s Last Stand, that infamous day in June, 1876 when George Armstrong Custer divided his cavalry force into three parts, then foolishly led one of those small contingents against an enormous Lakota Sioux village camped on the banks of the Little Bighorn River in what was then the eastern portion of the Montana Territory. Custer failed to perform even the most rudimentary reconnaissance of his adversary that day, and managed to get himself, two of his brothers, his brother-in-law, a nephew, not to mention the rest of his command, slaughtered as a result. Almost everyone is familiar with that story. But what many people are unfamiliar with, is that during the Civil War, that same, rash George Armstrong Custer had managed to put himself and his entire outfit into exactly the same predicament – getting his Michigan brigade cut off and surrounded by Confederate cavalry to the point that, had not timely reinforcements broken through to his relief, Custer’s entire force might well have been destroyed. The date was June 11, 1864, and the location was a small whistle-stop along the Virginia Central Railroad known as Trevilian Station. Custer’s Michigan brigade was part of a substantial cavalry raid ordered by General Ulysses S. Grant which was then moving west toward the Shenandoah Valley under the command of General Philip Sheridan. Grant, essentially pinned down at the time at Cold Harbor, had ordered Sheridan to move off with almost 10,000 riders in the hopes that he would draw off a substantial portion of Robert E. Lee’s cavalry, and with the additional objective of cutting the Confederacy’s northern supply line which ran from the Shenandoah down into Richmond. The enormous Federal column moved at a slow clip through Rebel territory, kicking-up massive clouds of dust as it did, entirely unaware of the fact that Lee’s scouts had spotted the Federal movement, and that the Confederate commander had immediately responded to the provocation with cavalry of his own. Directing that Confederate response was General Wade Hampton, leading his own and General Fitz Lee’s (the commanding General’s nephew) divisions west at a pace determined to cut the Federals off before they could reach the Virginia Central and begin tearing up track. The Rebel force was considerably outnumbered, consisting of approximately 6,000 horsemen, but they had gotten the jump on Sheridan by taking a more direct route, and had thus been able to gain Trevilian Station just prior to Sheridan’s arrival. On the night of June 10 the Federals bedded down a few miles north of the station, stomachs full and campfires glowing, entirely unaware of the fact that Hampton’s riders had arrived and were determined to dispute the issue. Custer’s Michigan brigade camped that night a distance from the main body on the Marquis Road, with orders to enter the station the following morning. The “Boy General,” as Custer was then known – having been elevated to the rank of brigadier general at the age of only twenty-three a year earlier – expected little more than a leisurely day, watching as his work parties ripped-up Rebel rails. But his expectations were rudely altered early the following morning when intense gunfire broke-out on the Marquis Road, not far from his smoldering campfires. It was soon determined that a portion of Custer’s command had been suddenly confronted by an entire brigade of Confederate cavalry under General Williams Carter Wickham. 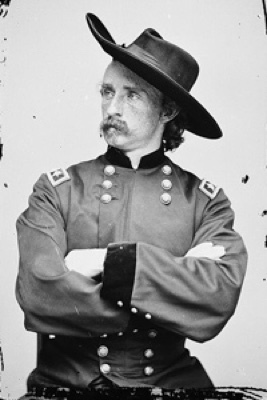 Custer realized at once that, since Wickham’s brigade was a part of Fitz Lee’s division, he was in all probability facing a major force of Confederate cavalry. The Battle of Trevilian Station, one of the largest cavalry battles of the Civil War, was about to explode across the rolling hills and woodlots of Western Virginia. Custer, typically, was undaunted that morning at the prospect of being outnumbered, and promptly led his entire brigade toward the station. Fortunately for Custer, Hampton had spread his defense across the turnpike that Sheridan’s main body was advancing upon, and had neglected to cover a side road that Custer soon discovered. Entering Trevilian Station unmolested, the Boy General stumbled upon Hampton’s entire supply train sitting near the tracks virtually undefended – an enormous prize under normal circumstances – and Custer, always thrilled with the prospect of glory and advancement, did not hesitate to order his troops up in order the seize the prize, which was quickly and easily accomplished. But taking the wagons and holding the wagons were two different things. The Boy General immediately ordered his men to throw up barricades, and his troopers complied in a frenzy of activity. Ambulances and artillery limbers were overturned, carbines and pistols loaded, but Custer’s little foray was soon discovered, and Hampton, irate that Federals had somehow snuck behind his lines and taken his train, ordered up reinforcement aplenty to deal with Custer. First to arrive were The Laurels, one of the elite units of Rebel cavalry under General Thomas L. Rosser that came thundering down the road from Gordonsville. 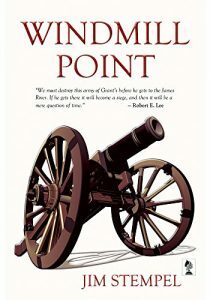 Rosser and Custer had been best of friends at West Point, but the Boy General knew that that old friendship was not going to earn him any sympathy that morning. 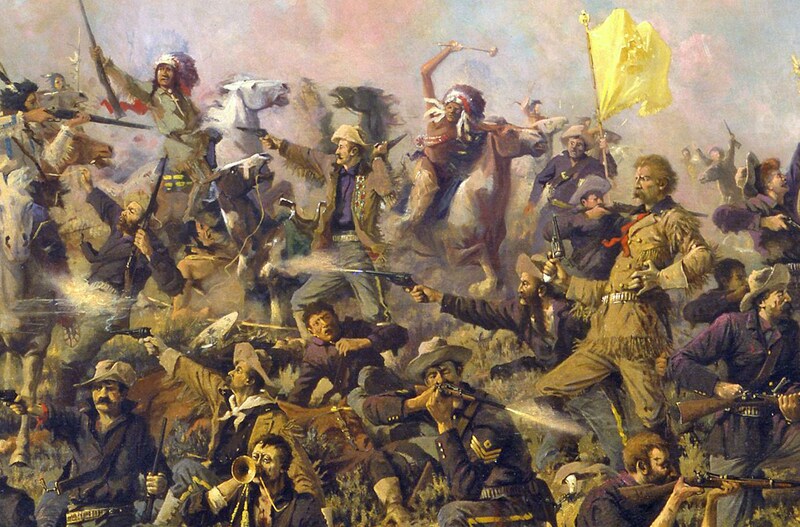 The Laurels quickly formed in fields west of the wagons, then charged – hats bouncing, hair tossing – as they screamed the Rebel yell and blew Custer’s thin blue line backward beyond the wagons. A wild donnybrook ensued. Sabers slashed, carbines thundered, and gun smoke swirled as Custer’s brigade was beaten back to a small knoll where it frantically consolidated. Soon, however, Fitz Lee’s division galloped up the road from Louisa Court House from the opposite direction, and immediately deployed in the woods and lots around Custer’s position. Marching up the knoll to where his artillery had deployed for a better look, Custer soon realized that he was now in big trouble, with no help, as far as he knew, on the way. The Boy General was completely surrounded. For hours the Confederates charged Custer’s thinning lines, mauling his brigade in the process. Forced back into a virtual circle below the artillery, the Michigan troopers fought furiously, and Custer – to his credit – was, as always, out front fighting and leading like a wildcat. But the Boy General would surely have been overwhelmed that afternoon had not Wesley Merritt, in command of another Federal cavalry brigade, finally broken through to relieve Custer’s beleaguered troops. With that Hampton was forced to fall back and consolidate his own position. 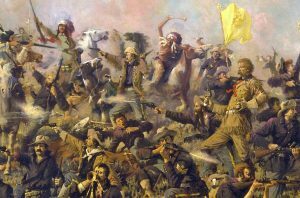 Custer was off the hook despite the reckless decision he had made – except, of course, for the numerous dead and wounded that littered the field. The Boy General continued to live on daring and good fortune throughout the remainder of his career, but his luck would finally run out some twelve years later when he made essentially the same mistake he’d made years earlier at Trevilian Station. But this last blunder was initiated too far away for relief to reach him, and the grave markers that rest above the Little Bighorn to this day silently attest to the fact that Custer’s second “last stand” would truly be his last.